We might not all be able to afford all three – or any – of these 3 things, but you can get them all in the Year of Cheer Specialty Designer Series Paper! 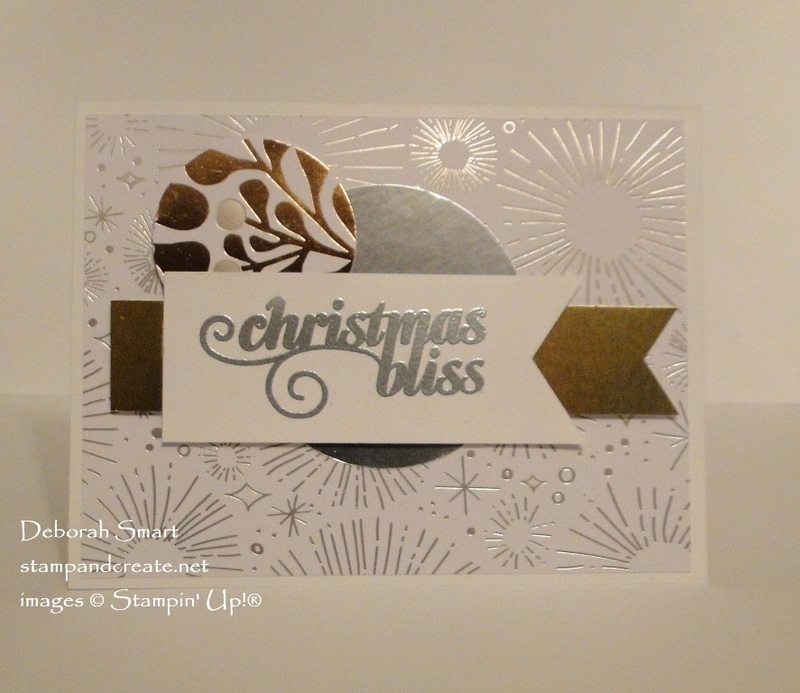 This is one of the designs that we created in my Annual Christmas Stamp-A-Stack a couple of weeks ago. Every holiday should include at least one card that sparkles and shines! The foils and heat embossing make this card look beautiful. What also makes this card beautiful for a card maker is the ease at which it comes together! Use the Whisper White Thick cardstock for your base. Add a 4″ x 5 1/4″ panel of the silver sparkle pattern from the Year of Cheer Specialty DSP, with Stampin’ Dimensionals, on top. Use the 2 1/2″ Circle Punch to punch a circle from the Silver Foil Sheet. Then use the 1 3/4″ Circle Punch to punch a circle from the copper/silver leaf pattern from the same DSP. For the banners, cut a 1″ x 4″ piece from Gold Foil Sheet, and a 2″ x 4″ from Whisper White cardstock. Use the Banner Triple Punch to create banner tails on the right hand side of each. Stamp the sentiment from the retired Christmas Bliss stamp set onto the Whisper White in Versamark ink. 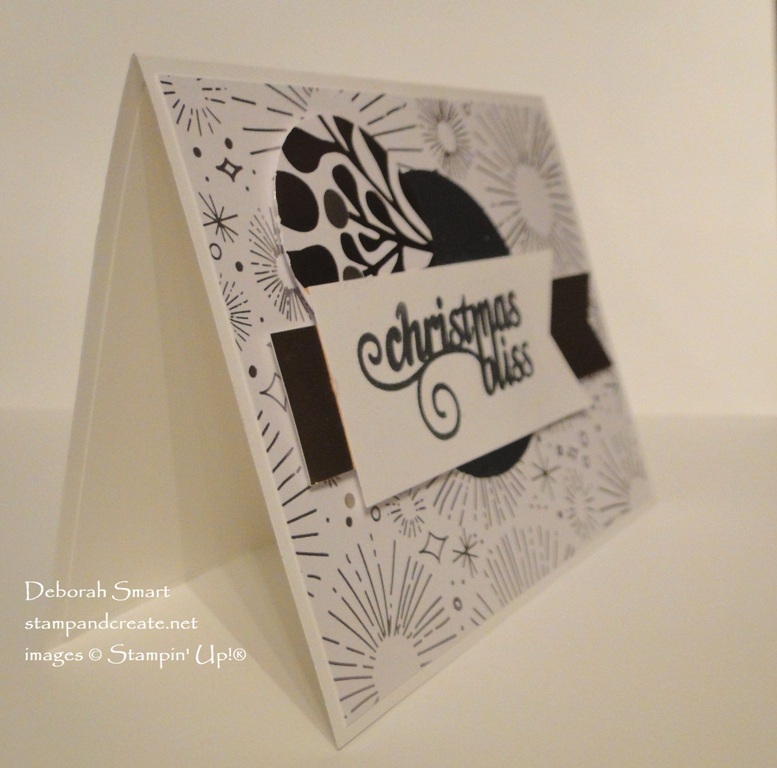 Cover with Silver Embossing Powder, and set with the Heat Tool. Attach the gold foil banner to the back of the stamped banner, with Multipurpose Liquid Glue. DEMO TIP: to save on foil paper, once you’ve created your banner tails on the gold banner, save that piece, and use it to attach to the left side of the white stamped banner! It gives the illusion of a very long piece of foil paper being used, but you’ve saved yourself about 2″ of gold foil! Once you have your banner pieces ready, now you can attach the circles to the card front. Attach the large silver circle with Liquid Glue, then attach the smaller DSP circle with Dimensionals. Offset the smaller circle to the upper left of the larger circle. Now, add your banners across the middle, using Dimensionals. Using this beautiful foil paper, with the addition of some extra foil papers and heat embossing really steps up this card. No one would look at this card and immediately think ‘easy to make’ – they would think ‘WOW’!! Next Next post: ANOTHER CHANCE TO SAVE! This is beautiful, Deborah! So rich. Thanks, Buffy! I love the shine in this DSP. I love that DSP. Who doesn’t love a little sparkle in their life?! Beautiful card!